A lot of us tend to ignore one of the most important parts of our body – our backs. A human’s spine is comprised of several bones and muscle groups, and they support not only your back, but your hamstrings, gluteus and hips as well. They’re essentially the bridge between your upper and lower body, and weakness in even the smallest portions of your spine can result in your entire body feeling its repercussions. Conversely, if other portions of your body (for example, your hip muscles) are unable to keep up with the rest of your body, your lower back compensates for this lack of activity by working harder, resulting in your back becoming more prone to wear and tear and thus, more injuries. All you have to do is lie down on your back. Then gently, fold your right knee and bring it towards your chest. Place both your arms on your knee and push it gently towards your chin. Hold for 5-10 seconds. Let go of your leg and bring it down. Repeat the process with your left leg. Do at least 5 reps on each leg. Lie on your stomach. Then slowly, raise your upper body. Bend your elbows (with your hands parallel to the ground) and raise your upper body. Then slowly, raise your upper body so that your entire body is parallel to the ground. You will rest your body on your hands, elbows and the tip of your toes. Begin by holding that position for 15 seconds, then slowly let go. Repeat this exercise at least 3 times, with reps of 5 in each set. Lie on your stomach, with your toes pointed outward. Have your hands by your side. Raise your head, then your shoulder, and then your chest. Then, go back as far as you can. Lift your arms as well – push them towards your toes. Hold this position for 10-15 seconds, then exhale and slowly go down. Repeat this process for a total of 3 sets (10 reps each). Lie on your back on the floor. With your feet on the floor, make sure your knees are bent i.e. facing the ceiling. 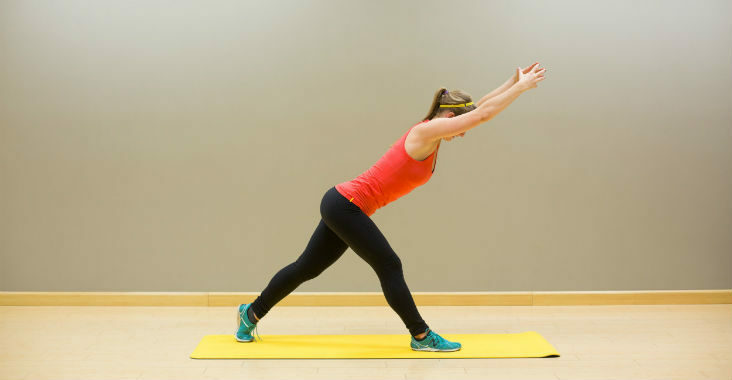 Now, squeeze your gluteus, and slowly, raise your hips. Raise them as high as you can, all the while keeping your eyes on the ceiling. Do it so that your body forms a triangle shape with the floor. Hold for 15 seconds and then go down while exhaling. Perform 3 sets of 10 reps each to get the best of out of such core exercises for back pain. As the name suggests, this exercise works on your piriformis muscle by lengthening it, if you constantly perform this exercise. This one might sound a bit complicated, so look to the picture for help. Sit down with your back straight, and with your right leg on the floor, cross your left leg over it, placing it right next to your right thigh. Now with your right hand, take it towards your left hand, so that your elbow and knee are touching. Now twist slightly towards your right side, and hold that position for a minimum of 15 seconds. Repeat the process on the other side. Sit on your knees, with your knees placed a little wider than your hips. Keep your hands behind your back, and stretch them outward. Slowly, bend forward so much so that your head is touching the floor and stay in that position for 15-20 seconds. Return to your original position, relax and repeat. Perform this exercise 10 times at least. Lie on your back, with your feet on the floor, your knees bent and facing the ceiling. With your hands on your side, slowly swing your knees (along with your legs and lower back) from side to side. With every swing, you will be able to feel a stretch on your lower back, which is good. This stretch focuses on your paraspinal muscles, and in order to get the best out of it, try to hold your stretches for as long as you can. Ideally, you should have a 15 second hold time, before moving on to the other side. Repeat this process for at least 10 times on each side. Now of course, this is one of those core exercises for back pain that can only be done at the gym, or if you have the back extension machine at home. With your legs fastened tightly under the leg anchors and your hands behind your head, slowly go up and down. Move at a comfortably slow pace, because you are stretching your back, not exercising it. Do 5 raises in one set, and try to do a minimum of 4 sets. Kneel on all fours. Slowly inhale and raise your mid back upwards, forming a reverse arch. Simultaneously, bring your head down. Stretch your back as much as you can and with your head. Hold the position for at least 15 seconds, and then while exhaling, get back into your normal kneeling position. Perform 4 sets of 5 reps each. Named after the little bird which tilts forward when hunting, this is an exercise that along with strengthening your back muscles will also work on you hip muscles. All you have to do is stand with one foot ahead of the other. Bend forward a little, ensuring that your back is straight the entire time. Lift your arms upwards in a manner that makes your body appear in a straight line from the side. Hold this position for 15 seconds, relax, and then repeat!